When you're a gas station, how do you make your advertising interesting and escape the easy option of trading on price, or convenience, in your communications? 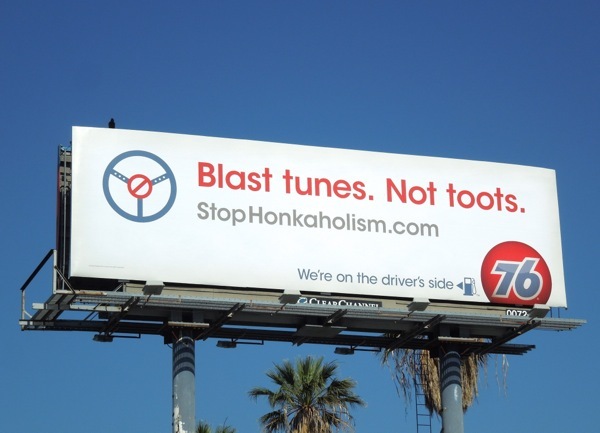 Well the 76 chain of gas stations has come up with a clever campaign that affects us all, 'Honkaholism'. 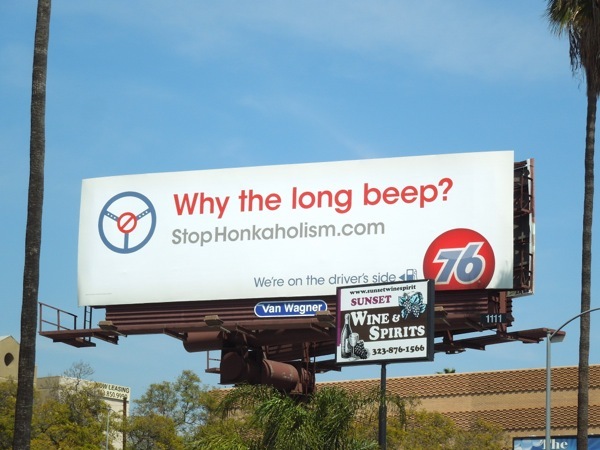 This witty and PR-friendly billboard campaign makes for some fun copy, which doesn't require a ton of visual imagery, let's the brand logo shine through, and is guaranteed to make motorists smile when they are driving past or stuck in traffic. 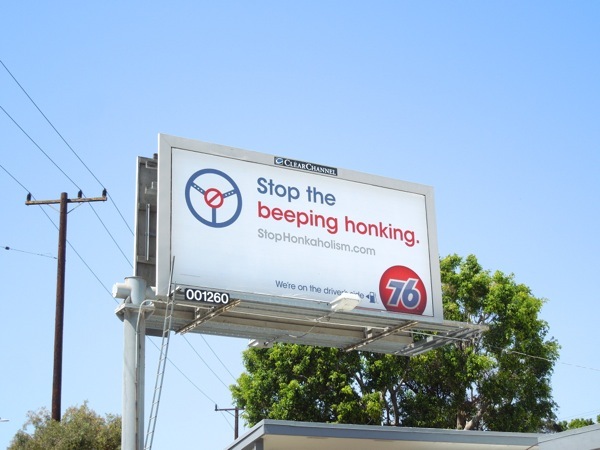 Everyone will tell you that Los Angelenos love to honk their horn at the slightest provocation (or none at all, for that matter), but Daily Billboard is sure that this ad campaign works in lots of cities across America (and the world). 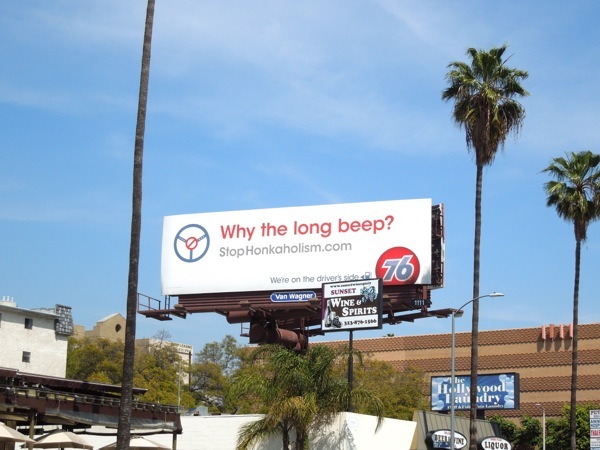 Daily Billboard was aware of these tongue-in-cheek ads around the streets of L.A. for a while, but first snapped the 'Why the long Beep?' creative on April 2 along Sunset Boulevard, whilst the smaller 'Stop the beeping honking' version was spotted along San Vicente Boulevard on May 10, 2013. What seems like another wave of creatives has appeared more recently, with the 'Give a hoot. 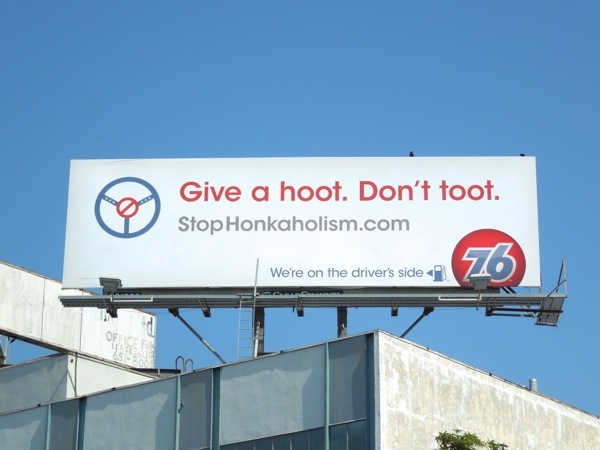 Don't toot' creative spied along Beverly Boulevard on July 2, plus the 'Blast tunes. 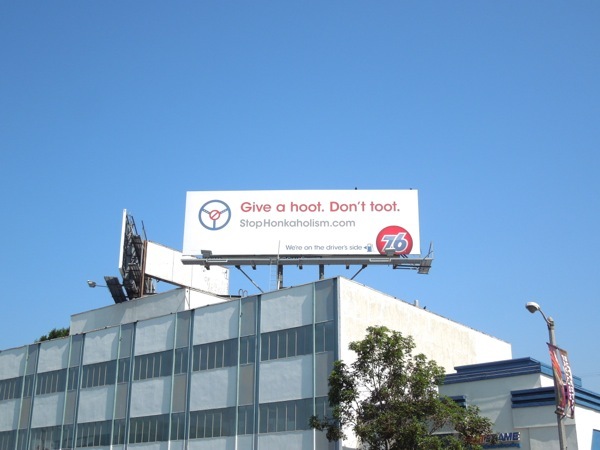 Not toots' ad was photographed along Sunset Boulevard on July 8, 2013. 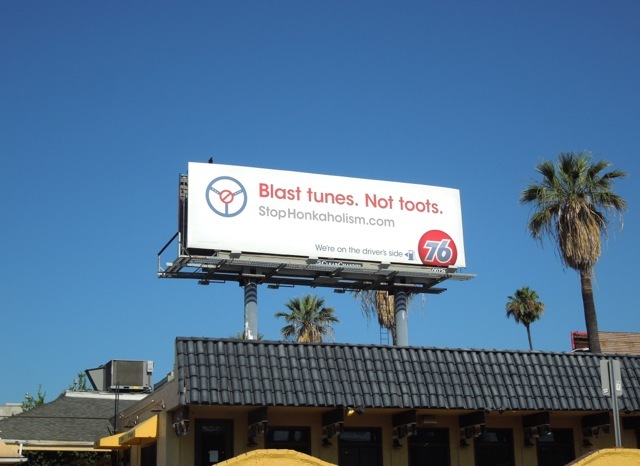 Noise pollution from cars can be a real problem in residential neighbourhoods, and unnecessary honking really is annoying and stressful on busy city roads, so this 'Stop Honkaholism' campaign from the 76 brand is truly a stroke of genius.